Now, for those who want a challenge with their 1590B enclosures..
A challenge? If fots in a 1590B with ease, and if you use low profile jacks you have even room for a battery. yep, my layout fit in a 1590B with plenty of room. Miro's should too. I saw your build. Nice. Did you simply leave out the 'prescence' pot and use the 'mid'. I do not see a mid pot value etc..at the bottom of the diagram. I count 6 pots at the bottom and 7 possible connections from the board. I am confuuuuuuuzed. Let me know what you did please. Thanks man. How do I put the trim pot on the 'above board'? I have the board all built as above. Can you help me put the trim pot in this board? If you use single core, or sturdy multicore wire you can just have it floating over the top of the area you're soldering it in and the wire will hold it in place nicely. On the original layout. What does the VB+ on the right side of the board mean? Anyone got a replacement for the 549C's. I have BC550's and BC549(no 'C' suffix) will these work? Yes they'll work fine. The C has a listed current gain of 420 to 800 hfe, just measure a few and use the ones with the highest gain you can find. If I wire up a 10k dual linear pot instead of a 50k dual log drive pot, will I wreck this thing. Also, can I use normal pots instead of rev pots (wiring them backwards if I want)? It wouldn't be very good. The value of that pot determines the gain, and so using a 10K will give you 5 times less. I wouldn't do it myself, I'd prefer to wait for the right one. I'll order some parts. I put a 12ohm resistors on some 50k rev pots for the 10k value. I get a few 50k rev pots and try to be patient. Has anyone noticed the 'mid' connections from the board to.........? I don't see a mid control for the board connections....thoughts? OK! I am about done and get to the bottom right of the board and see 'VOLUME 3 /' next to the third trace up. Is that a hook up to the trace or a hookup to the above trace 'VOLUME 1' or to the trace below 'BRIGHT 2/3? There is no line to the trace is why I ask. Volume 1 connects on its own. Volume 3 and Bright 2 and 3 are linked in whichever way works best for you. So take 2 wires from the board, one to Vol 3, one to Bright 3, then make a little link from Bright 3 to Bright 2. Or daisy chain from one to the next. Whichever makes things easier for you with the offboard wiring. Thanks. The sound is outrageous. It will be nice when I can control the volume. Disregard...I think it was intended that the power goes through D5, then to the 100R and then to Pres 3. Found a LM833 that I set aside just for this build, removed a errant glob of solder on the ground row and the board is now working sort of. Unfortunately, it starts fizzling when the gain pot is above 60% rotation. Should lugs 2/3 of Drive (Gain) pot A & B be connected or does it matter. I also found a spot for the 20k trimmer in the lower left corner of the board by adding a few cuts, moving a jumper and adding 3 more. Update. I have built two now, one from this layout and one from JohnK's layout. John's layout worked fine on first try. This layout still has some issues which I addressed as follows. I felt obliged to change the wire connections on some of the pots on the TBE layout to match JohnK's, as his seemed to agree with the lug connections on the schematic I found. 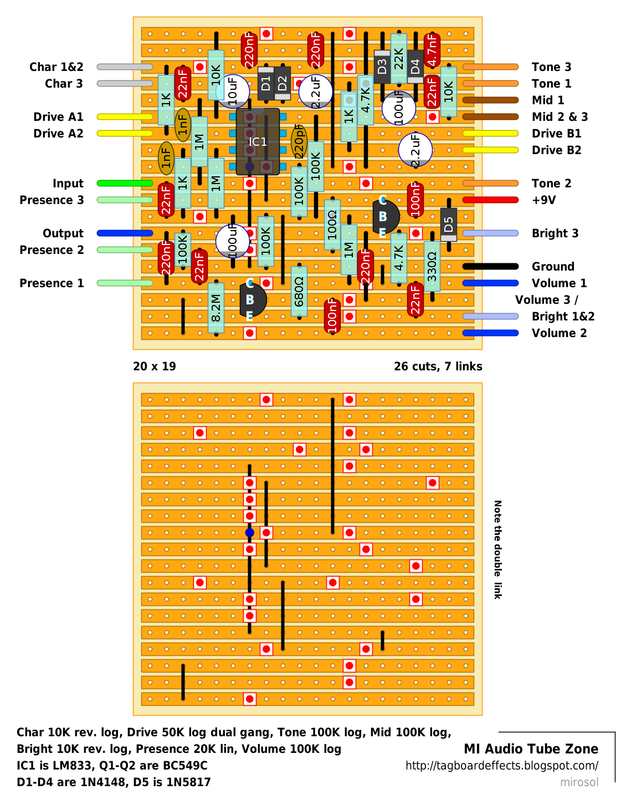 Lug changes included the swapping of Tone 1 and 3, swapping Drive B2 to B1 and B1 to B2/3, swapping Drive A2 to A1 and A1 to A2/3, swapping Char 2&3 to 1&2 and 1 to 3, and finally swapped Bright 2&3 to 1&2 and 1 to 3. Honestly, I don't know if any of the above changes made a difference, as I ended up also replacing the two 1nF caps (was "greenies" is now box film) which greatly eliminated most of the fizzle, but, there is still very slight traces of fizzle depending on where the pots are set (mostly the volume and the mid, or so it seems). May have to do some more trial and error cap replacements. Aside from that both work great and the range of tones and fuzz as quite dramatic. Hello, wich is VB+ in the Johnk´s layout? Sorry I just don't know which mean "VB", is it a component? no, there's no component. it just indicates where the 1/2 voltage of the main supply is. What Value pot do we use for Mid??? Resistor 1M across the input is correct? It's not across the input. it's from input to groud. That's the input pulldown resistor to prevent pop sounds that may occur with standard true bypass switching. There isn't one on the traced schematic, but i tend to add those by default as it's simpler to have it on board than to answer questions about switch pops. i dont understand the volume 3 wire? i read the reply to jef atiken (feb 27 at 00:42 about hooking the wires together vol 3 to bright 2/3 but the line marked on the board says bright 1/2 are combined at pot and bright 3 is alone? i tried every wich way.i have a problem with volume bleeding through when the volume pot is turned full ccw.it turns down but have high freq bleed through. Hi, I've been wanting to build this thing for a while, but was wondering if it's possible to modify the amount of pre-gain bass cut via a component change, say one of the capacitors? I recently discovered that a certain amount of bass cut (pretty much a treble boost at this point) helps me get the sound I want out of my distortions. Thanks in advance for replying! Just to warn up this dead thread: I built this twice in the meantime, once with this layout here and once with John Ks layout. Dunno how you feel about it but I can't seem to get this amount of Drive out of it the original 6 knob thing has (I recently bought one used). How's your experience with it? Wanna compare schematics? I traced those veros and "transcribed" them into Eagle Cad. if you want more drive just replace the dual 50K pot with a dual 100K one.